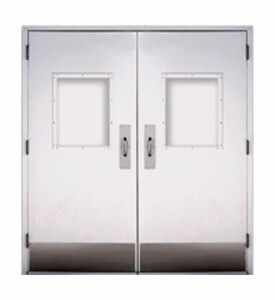 Paired Swinging Laminated Fiberglass Manual Door | Dock Door Systems Inc. The budget conscious LXP paired swinging door system with its clean and durable fiberglass door panels will meet your FDA requirements, while providing years of superior performance. Up to 8' x 8'. 1-3/4” thick laminated fiberglass panel surface with finished edges of reinforced, pultruded fiberglass tube. Grade 1 Architectural hardware standard: Hager BB1191 standard weight stainless steel fully mortised hinges. All stainless steel construction available in 316L.14 ga. stainless steel frames.